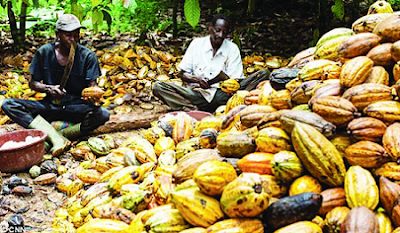 Cocoa farmers yesterday raised the alarm over alleged procurement of ‘fake ‘chemicals and other inputs for its members by the Federal Ministry of Agriculture. The inputs, particularly fungicides, according to Cocoa Farmers Association of Nigeria (CFAN), have destroyed several cocoa trees and farms. The farmers want President Muhammadu Buhari to quickly address the issue which they say is a deliberate attempt by Federal Ministry of Agriculture officials, Abuja at sabotaging his efforts at rejuvenating cocoa production in the country. Its National Vice President (Southwest), Ayodele Joseph, who spoke with reporters in Akure, Ondo State capital, lamented that the farmers had approached the Ministry officials on the need to be consulted whenever critical issues relating to the procurement of inputs were to be discussed in order to make contribution. He said: ”We want Buhari to know that most of the inputs procured in the past like jute bags, solo sprayer, pumps, fungicides and insecticides were rejected by cocoa farmers due to its low standard.